Wow, what a day this was! Day 3 started with me sleeping in by 1 hour and 15 minutes! And this was the first day that my boss was back from vacation. No way was he going to beat me into the office! I am so thankful that in my fridge was a bowl full of boiled eggs and and a tupperware container of cream cheese muffins. 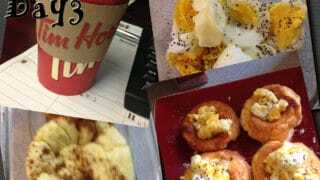 I didn’t get to make my own coffee this morning, I stopped at Timmies near my office and got a black coffee. on the Egg Fast diet plan is because it makes it easy to use up those fats! Between the Egg Fast and doing a 30 day Zero Carb experiment, I managed to kick both the HWC and splenda habit. I have used a little bit of sweetener during this egg fast, but the 1-2 servings a day is a tiny fraction of what I used to have. 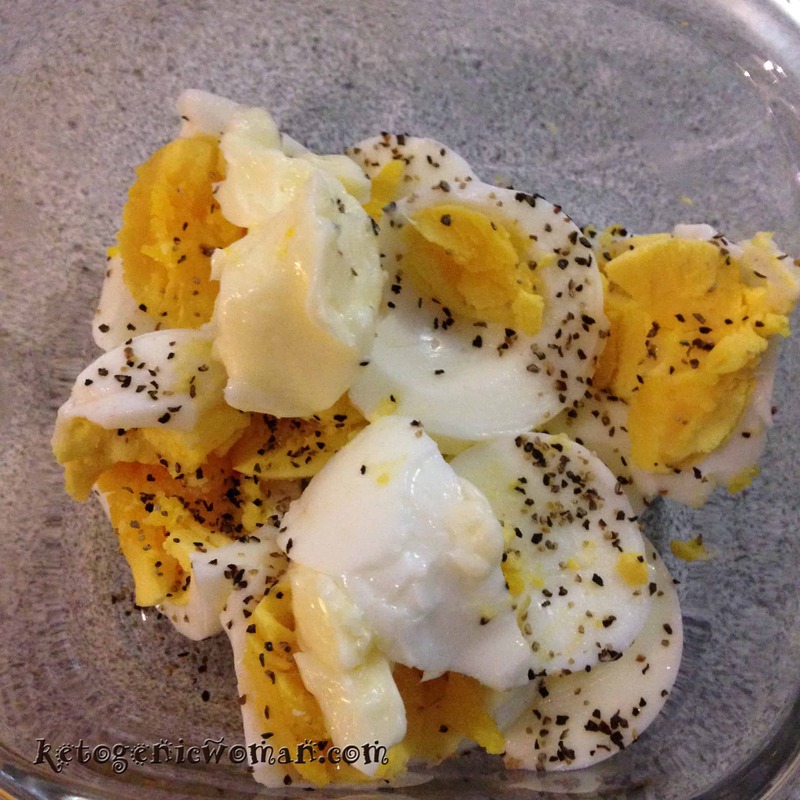 8:30am – 3 boiled eggs chopped topped with 2 tbsp butter. I microwaved for 30 seconds to warm it a bit. It was actually quite divine. 12:30pm – 3 cream cheese muffins. These were the muffins that I made yesterday on Day 2. With my muffin pan, 3 muffins = 2 eggs, 2 cheese and 2 fat. So happy to have those in the fridge for these emergency situations. 5:30pm – Oopsie bread with scrambled egg topping. See how fancy I made them!? They made me feel swishy just having them on my plate! Separate egg whites into one bowl and put yolks into the other bowl. 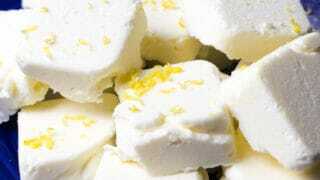 Rinse off beaters and beat cream cheese and egg yolks on low speed until smooth. With a rubber spatula, fold the egg yolk mixture in the egg whites gently until incorporated. Bake for 30 minutes, and then let cool. 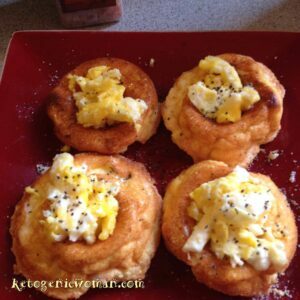 What I did with mine is scramble an egg in butter, and then I put the egg in the little indentations from the donut pan. I ate 4 of them which equaled 1.5 eggs (half the recipe), 1.5 cheese and 1 egg scrambled in 1 tbsp butter. on fats. 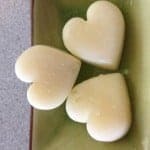 So I made some quick fat bombs in the freezer from yet another great idea that I read in the EF group. I melted 2 tbsp coconut oil, 2 tbsp butter and 1 teaspoon sugar free salted caramel Torani. They are in the freezer right now. I will update this post tomorrow with a picture and a verdict of what I thought of them! UPDATE: Ok the fat bombs look pretty but were too salty for my taste. I do like the sweet/salt flavor combination but I think using salted butter and salted caramel together was too much. On the good side, they were nice and creamy and something to savor and let melt in my mouth. I will be experimenting with this one for sure. So the last thing that happened is that my brother in law called and is arriving in town tomorrow afternoon. I may not be able to get a post together and I may also have a transition meal, depending on when he arrives. More to unfold! 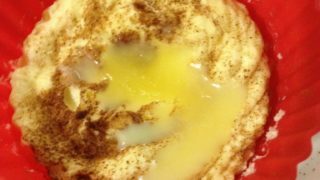 Tagged boiled egg diet, egg diet meal plan, egg diet weight loss, egg fast diet results, egg fast recipes. Bookmark the permalink. Thank you for all this fantastic information! Today was day 3 and I’m down 4lbs after yo yo -ing 2-3 lbs for a couple weeks. 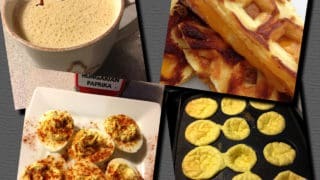 Three months ago when I started Keto I read another article about the egg fast and thought I’d never be able to do it. Your articles made it super easy! I even ate out! I ordered 2 steamed eggs and had the fat in my bulletproof coffee (Kerrygold butter and coconut oil). Thank you for such thorough information. Next up is to re-read the one about incorporating Keto back in. I’ll stay off the scale for a few days, add food back in slowly as you suggest. I am so happy to hear this! 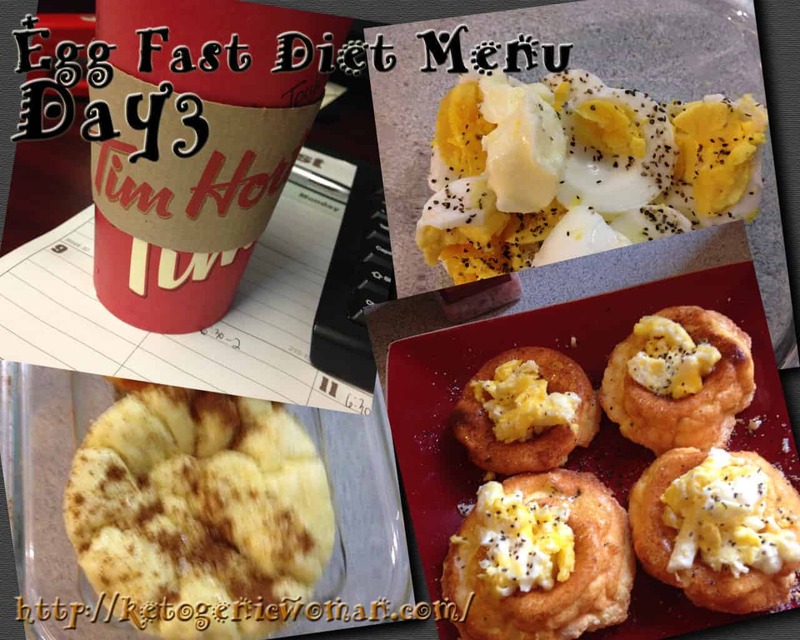 The egg fast got me back on track again after months of floundering and losing the same few pounds over and over. Good luck! I understand how the Egg Fast works. One ounce of fat per egg. But in your meal plans, you mentioned 1 tablespoon of fat per egg. For example, 2 tablespoons of mayonnaise with two hard boiled eggs. But, 1 tablespoon is only 1/2 an ounce. 1 ounce of fat with each egg? It is actually 1 tbsp per egg! I know of some people who did it with 1 oz per egg by mistake and they still lost weight! Thank you for posting this! 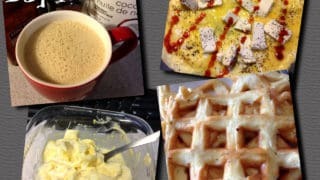 I was curious if following some of these egg recipes (egg salad for instance) for breakfast and lunch would still result in some weight loss with eating a normal low carb, high fat dinner? 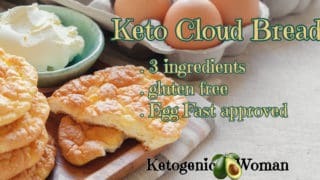 I’m the only one at home doing keto and for some reason, the others aren’t supportive so I’m thinking eating eggs for dinner might freak them out. Actually yes it would! If you eat an egg fast meal for breakfast and lunch and then a strict keto meal for dinner (protein and some veggies), that is what we follow for transitioning off the egg fast. And I know people who follow that plan all the time to keep their weight down. So yes! Try it. Check out the egg fast transition recommendations here so you can see what I mean. Thank you so much for replying back! I’ll definitely check out the link! do you do intermitent fasting with egg fast? and i read that you should eat 30mins after you wake up do you follow that? Yes, you can do intermittent fasting while doing the egg fast. You can read all about my results here! Can you use mct powder instead of coconut oil in tea? I would avoid it, it’s only a few days. It’s not the same as getting an actual satiating fat. Help! Been on the egg fast for 3 days and GAINED 2 lbs! Been following the fast 6-7 eggs, 6-7 fats, and 4 or less ounces of cheese per day. Also, drinking 100 oz or more of water per day…..urgg? That’s pretty frustrating and it does happen. It can depend on many factors such as medications, hormones, what was eaten prior to EF, etc. If you are up to trying again, I would skip the cheese 100% and do 7-8 eggs plus fats. If you were to do this diet for more then 3 days, do you just repeat the foods from the first 3 days? Sure you could do that. 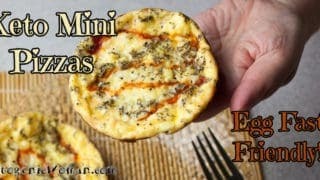 There are lots of egg fast recipes out there now as well. If you are on Pinterest, I have saved many of them here on this board. What if I do not have a donut pan or whoopie pan. Will a muffin pan work? Those pans just help to shape them. You can even just spread the mixture onto a cookie sheet and then cut them in equal portions after they bake. 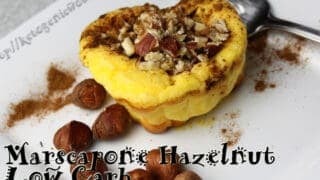 I tried making the fat bombs but was just using plain Carmel sf torini syrup. My syrup separated from the fats. What could be the reason? You have to use a very tiny amount, no more than 1 teaspoon. Then what I do is I am stirring it the whole time I am pouring into the molds and then it goes into the freezer right away. Forgive if this has been asked and I overlooked, but I was thinking about 1/2 an avocado is equal to fat and calories of a tablespoon of butter… good option to mix it up? Or, you think the minor net carbs would undermine the goal??? The egg fast is very limited, only eggs, fats (butter, mayo and coconut oil) and a little cheese. pretty much those are the choices. Avocado is not pure fat. 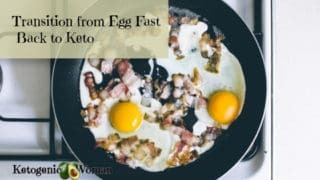 On regular keto it is a perfectly acceptable source of fats, but the egg fast is just like it sounds, it’s a fast with very limited foods, so best to try it the way it is intended before tweaking it and then being disappointed that you didn’t break your stall. the salted duck egg is allowed? For sure a duck egg is fine, but I don’t really know anything about a salted duck egg and if they are nutritionally different. Looking for a little help with this. I would like to try it for a week and see how I do. I am about 25/30 over wt and this is the most I have ever been. (not happy). Looking to see what we can drink and not. Anything you can help me with would be great. The egg fast is very limited, only eggs, fats (butter, mayo and coconut oil) and a little cheese. pretty much those are the choices and this is best suited for people who are already doing keto and understand the principles. 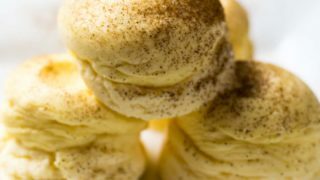 In the FB group there are a lot of recipes so that is a good place to go if you need some recipe ideas. If not just follow the rules by clicking on this egg fast post.. Thank you for explanation on EF…. I will start it immediately after Easter and then I shall get back to how it was. A smidge of vanilla or a little vanilla sugar free syrup. Mix all ingredients in a high speed blender or nurtribullet. Let it sit a few minutes before pouring into pan. Pour into a lined and greased smaller pan. Bake 20-25 minutes at 350° until set in the middle. Allow to cool completely and chill before serving. 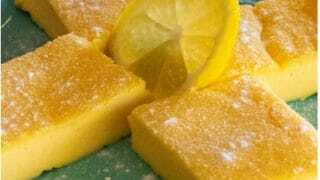 So if you cut into 4 squares, it would each be 1 egg and 1 fat per square. Easy!! I noticed on day 1 you had string cheese as a snack at 11:00 but day 2, 3 didn’t have the snack. Is it optional on the other days? Cheese is totally optional on the egg fast on any day. Most people try to use as little as possible because they get better results with just eggs and fats. 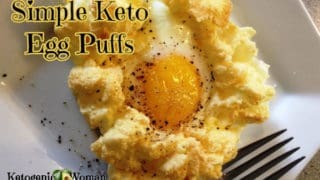 KetoWoman, thanks for the tip. I love cheese but looking for the results. Have you tried making the fat bombs again/ Maybe adding them to black coffee will offset the salt and using another torani syrup mike almond roca? How many did u make from this recipe? yes, you can mix it up for sure with different flavors. Hmmm, sorry I can’t remember exactly how many I made because I have different size molds. SOme of them hold 1 tbsp and some hold 2 tbsp. I like the smaller ones best. 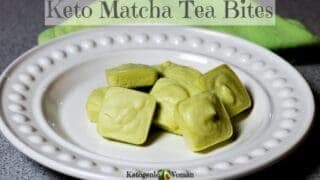 If you like Matcha have a look at these egg fast fat bombs here. can I leave out the cheese from the egg fast diet, can I have the same food on day three , as day 1. Cheese is completely optional and many do better without it. Yes, eat the same food all you want. The egg fast only has a limited selection. Even if you make different recipes you are eating the same thing every day, trust me! I don’t have a waffle maker — would it work to make pancakes and have a pancake sandwich the next day? Thanks for the great recipes. Sure! You can do that! wow, awesome results! Thanks for sharing! Can I have lemon or lime juice and fresh ginger in my water? Well you’ll have to decide that for yourself. These things are not egg fast protocol and I tend to follow things exactly for best results. It’s hard to know what effect, if any they will have. Hi Tina, are you still doing EF and do you take the lime juice and ginger water with this diet and how was the result? I am doing the same thing and it just helped me feel fresh after eating eggs all day. So let me know if it worked. Hi for your waffles (2 eggs 2 tbs mayo) does the mayo count as fat because I saw a post where you drizzle butter over them? 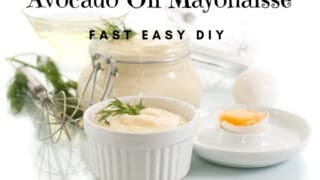 Yes, the mayo counts as fat. If you use another tbsp butter to drizzle over top, then you need another egg someplace in your day to offset that. Use the Egg Fast Tracker to keep track on your phone, it makes it easier. 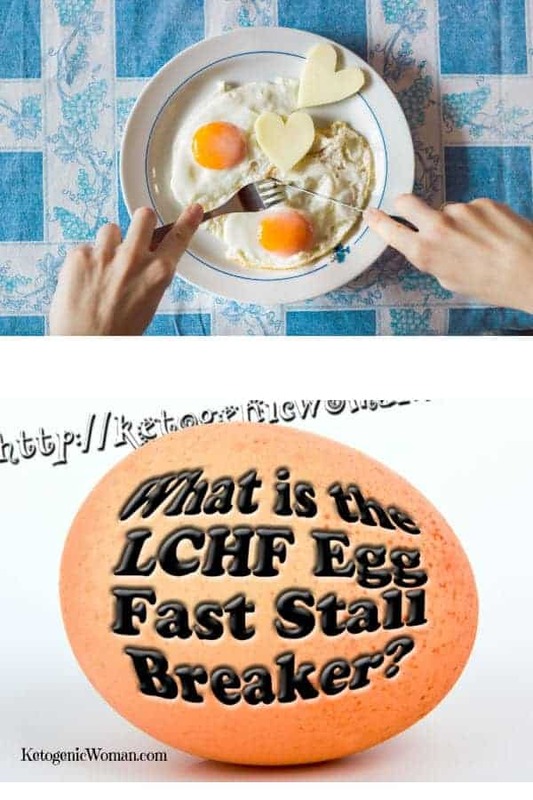 How long can you do the Egg fast? You posted about doing it for 3 days but is that as long as you can do it? What would happen if I do it for a week? I normally do it for 5 days, but some do 30! Up to you! Good luck! How much did you lose on your 3 day egg fast? Hmmm, this post is a year old at least so I can’t remember exactly. But I always lose at least 5 pounds whenever I do the EF for 3 days. I hope that helps! So in other words you are intolerant to eggs. I would say probably not unfortunately! Maybe try the Fat Fast instead? Or Alternate Day Fasting? How many fat bombs does your recipe make? And how many fat bombs per egg consumption on the egg fast diet? I do not expect you to be an expert nutritionist on everything, but maybe you could steer me in the right direction. I take 100,000 Units of Vitamin D3/ wk, 650mg of iron/day, and 15mg of meloxicam/ day (all per prescription), plus a Cintrum Silver. None of the bottles give information as to whether there are carbs, fat, etc in them. 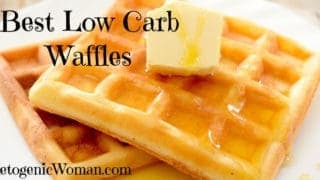 I am trying to find the answer to the fat/carb questions. Do you know of a way I can find that information? I have read that supplements and medications can cause problems with weight loss. You are right, it’s hard to find out and I wish they had to put carb counts on the label. The best way to do it to use google and the exact name of your product. So if it’s Jamieson Vitamin D for example, go to the Google search bar and type in How many carbs in Jamieson Vitamin D? That should get you the answer. Hope that helps! They are all script, so no brand names. Thanks anyway. Today, no more cheese. I’m going to eat more meat with fat and still try to keep my carbs at around 5g. You can’t imagine how much I’ve learned from you. I am very grateful to you! Even cutting out cheese for the 2nd half of yesterday really helped me. I lost another .8 lbs! You’re AWESOME! Yay! Happy it is helping you! Have a great day! Hey! I’m back. Seems that even though I’ve been watching my carbs and protein intake for the last two weeks, keeping my carbs to around 5% and my protein is hard to gauge, but keeping really small portions…I’ve stalled again. I really don’t want to go back to the strict egg fast. So I was wondering what your thoughts are on a frittata. We used 10 eggs, about 1 ½ c. of cheddar, ¼ c. red onion, ½-1 c. bacon ends (lots of fat) and a ½ c. sliced shrooms. If I microwave it with butter, will that possibly help me break the stall again or are there just too many other things in it? I mean, if I eat like a ¼ cup slice each time for my meals? I know it’s not a science and just eggs, butter and cheese are the best but I just have a hard time with that now because I didn’t LOVE eggs to begin with and I burned out after the 4 days. Thanks in advance for any advice you can offer. This is a little hard because I don’t have much info, like how close are you to goal weight, medications, what are those carbs that make up the 5%, etc. Also 5% of what? If you eat 2000 calories and 5% are carbs, that might be too many carbs! But generally speaking, if you were able to lose weight on the Egg Fast, but not able to lose weight on your normal eating program, then you want your normal eating program to as much like the egg fast as possible. Doesn’t have to be eggs, it could be other protein. I hope that makes sense and helps a bit. No, not a 2,000 cal diet at all. I’m mostly eating cheeses and (still) eggs, some chicken, some bacon and very few veggies. When I eat veggies like chives, or shrooms (which I consider a veg), they’re drowned in butter. I’m getting as zero carb as I can. When any food says that the carbs for it is like 1.2g or whatever per serving, I’m keeping as close to 5g as possible for the whole day. So I guess I said 5%, but it’s really 5g. I love chicken so even though it’s white meat, when I eat it, I still add butter to about an ounce/ounce proportion. And yes! You’re explanation makes sense. So thank you! I forgot to tell you, I’m within 6 lbs of my goal weight and no medications. And my only carbs are those few in the small portions of veggies that I have. Like the mushrooms…if a ½ cup of sliced shrooms is approximately 1.2g carbs for that whole frittata up there, and I’m only eating about a cup’s worth of the frittata each meal, I can keep up with it by adding all the carbs from them, the onion, and the tiny bit in the eggs, then divide by the 10 slices (about a cup each) that I divided it up into. Also, the info you mentioned made me rethink my protein. As of yesterday, I have begun to see the scales going down again. I only had about 2 or 3 g of protein yesterday. ok, 6 pounds to go only so yes, this is challenge for you! Are you sure you only had 2 or 3 g of protein, that seems like nothing! Cheese is a known staller so that would be the first change I would look at. Cheese has been a big part of my keto/20 lb challenge. I just got totally sick of eggs. I still get one down in the mornings within 30 minutes of waking up but, ugh. Other than eggs and cheese OR just eating a stick of butter (lol. jk), what should I do? I got down another 3 but they came right back. I should be happy that I have basically lost 14-17 lbs (it fluctuates) but really want to get down to my -20 from where I started. I try to keep protein to a real minimum but not sure if that ¼ c. is hurting or helping. How do you store the leftover oopsies? Do you reheat by toasting or microwaving? A BIG thanks for sharing all of the details – I think this variety will help me greatly during my next EF.